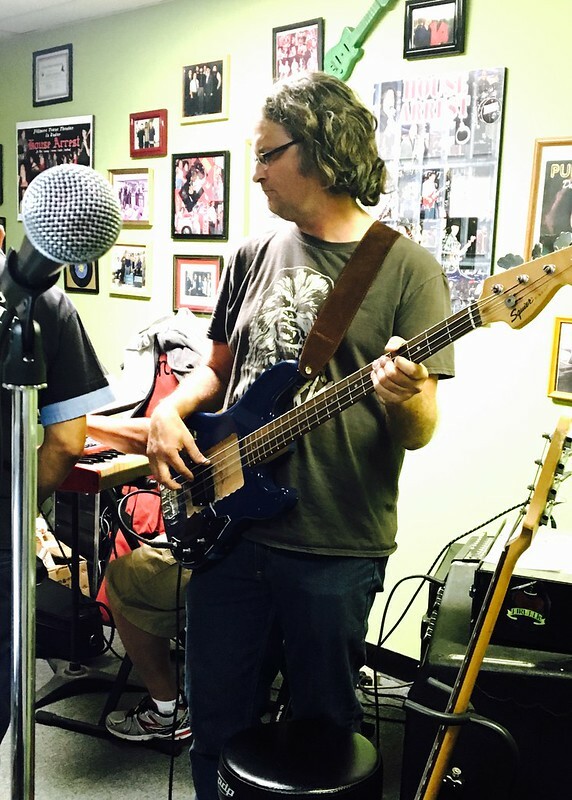 Pretty good little gig at the Avocado Festival in Carpinteria, CA. 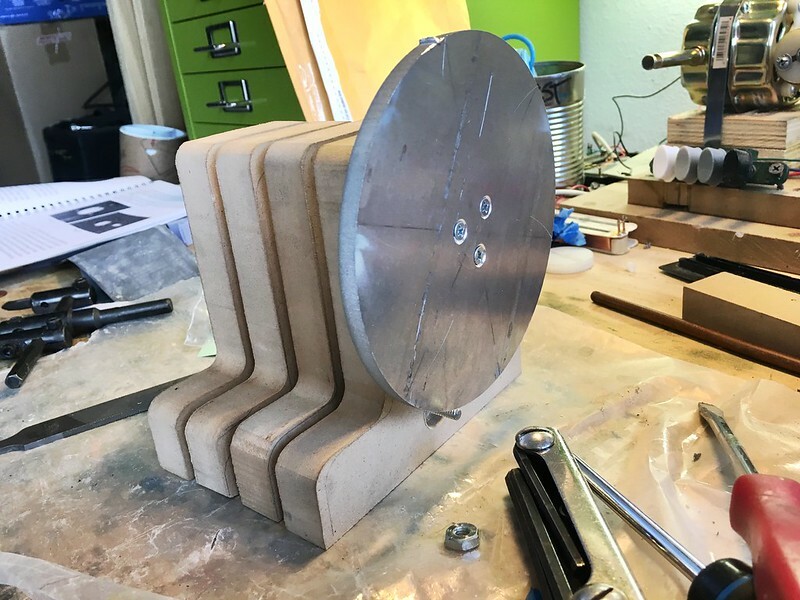 To get this blog up to speed, I’ve been obsessed with pickup winding since about December of 2015. 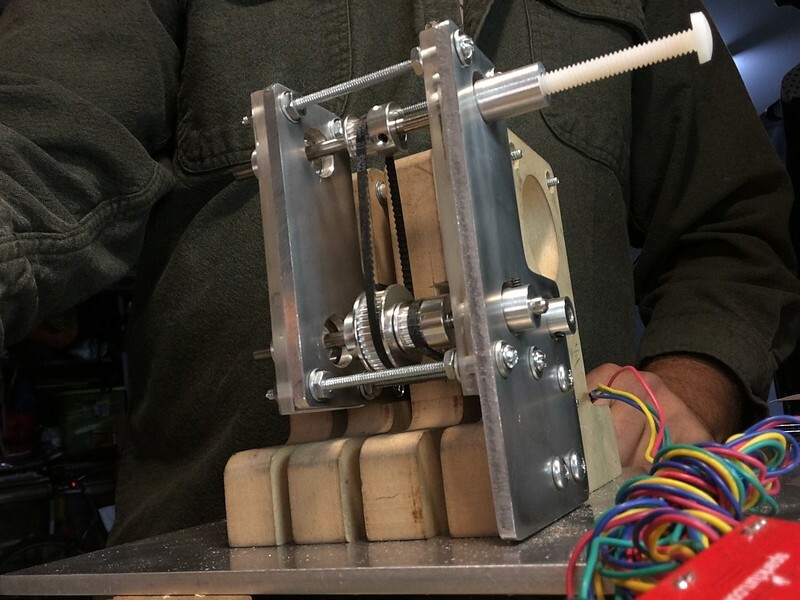 I build a winder from Jason Lollar’s plans and I’ve been winding furiously since. I’ve been taking a little break from winding the last few weeks, largely because I realized that I’m going to need to upgrade my winder. 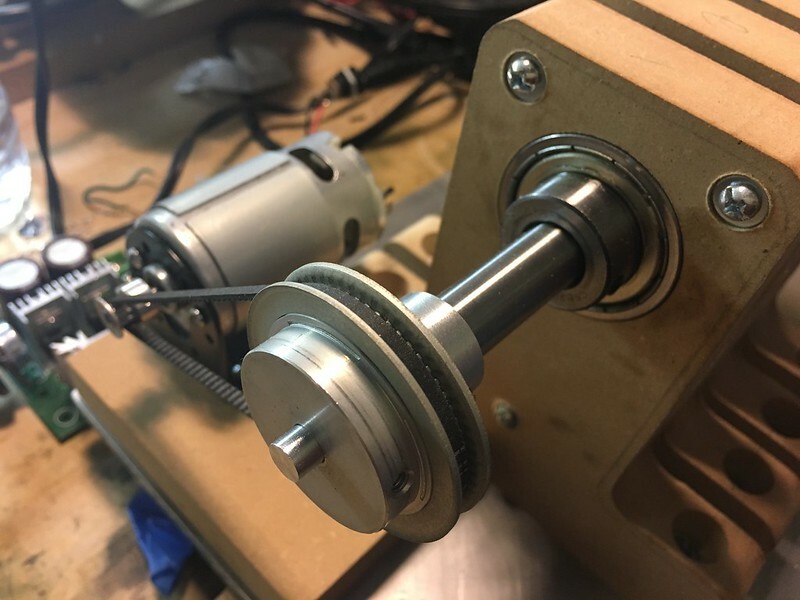 The one I build from Jason Lollar’s plans is great for winding by hand, but the cam-driven auto-traverse mechanism is kind of problematic for my purposes. For one, the nature of the cam’s motion causes the wire to pile up on the sides. I’ve been able to make it work by feathering the speed control, but the sides inevitably have a few loose winds here and there. Secondly and thirdly, it doesn’t give any real control over the thread spacing nor am I able to accurately repeat any results I get from my builds. 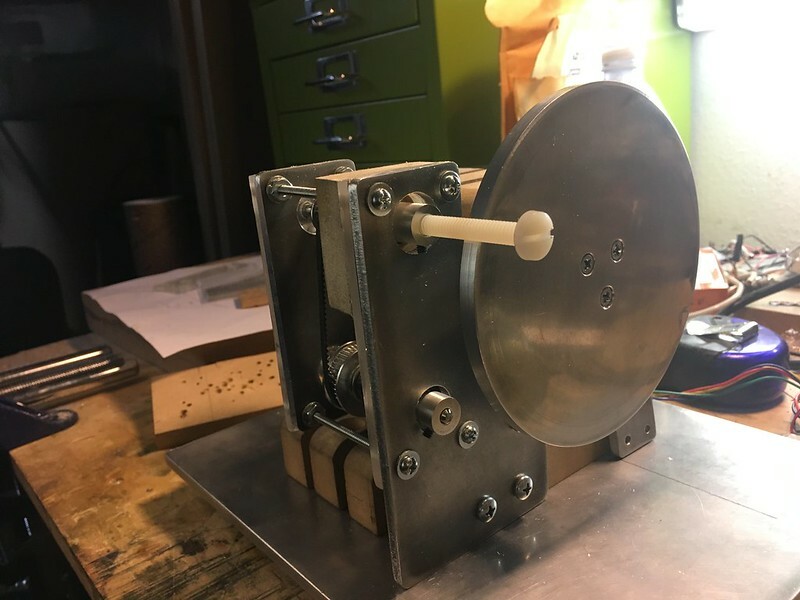 I stopped Bruce Johnson’s place a few weeks ago and he gave me some advice about making the traverse really work – specifically, I’ll need to make a device that will advance the traverse a given distance per revolution of the winder. Running from one motor, Bruce’s machine does this mechanically and it basically makes getting a nice, even wind pretty much 100% foolproof. He was really recommending and pretty willing to help me go the mechanical route. I think that the mechanical route has a lot of advantages, such as simplicity, longevity and reliability. However I’m much better with writing scripts and working with computers than I am building mechanical devices. I’ll give this a shot and see how it pans out. If this works, the machine will have a smaller footprint which will be better in my really limited space. 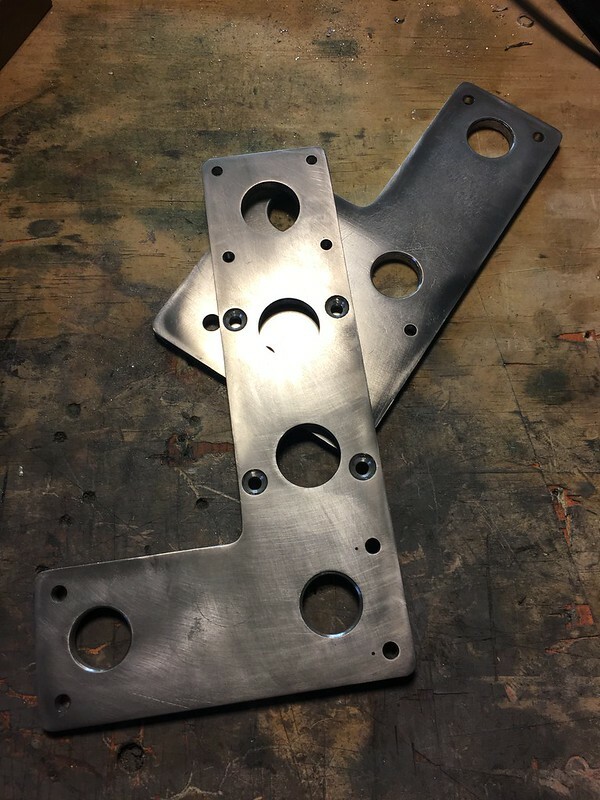 The first step was getting the winding motor. 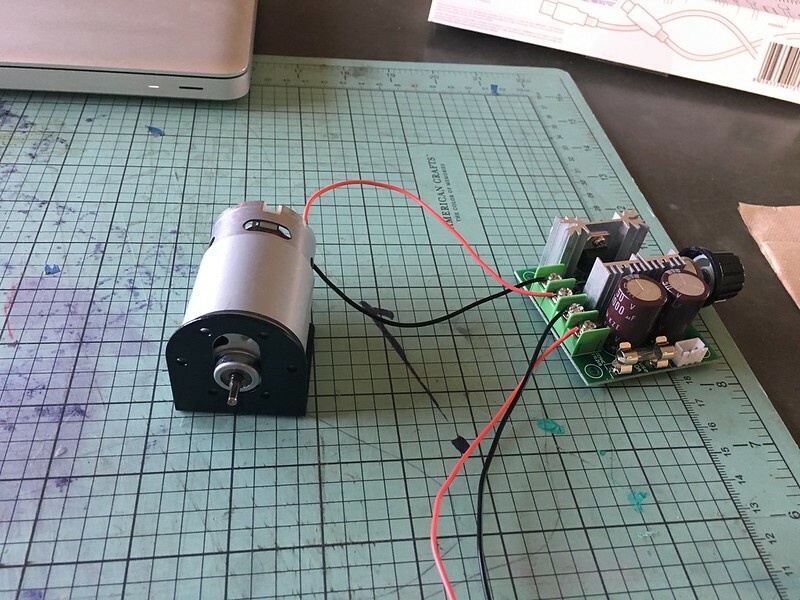 I got an 18v DC motor for $15 on Amazon, along with a nice pre-made speed control. It works great. 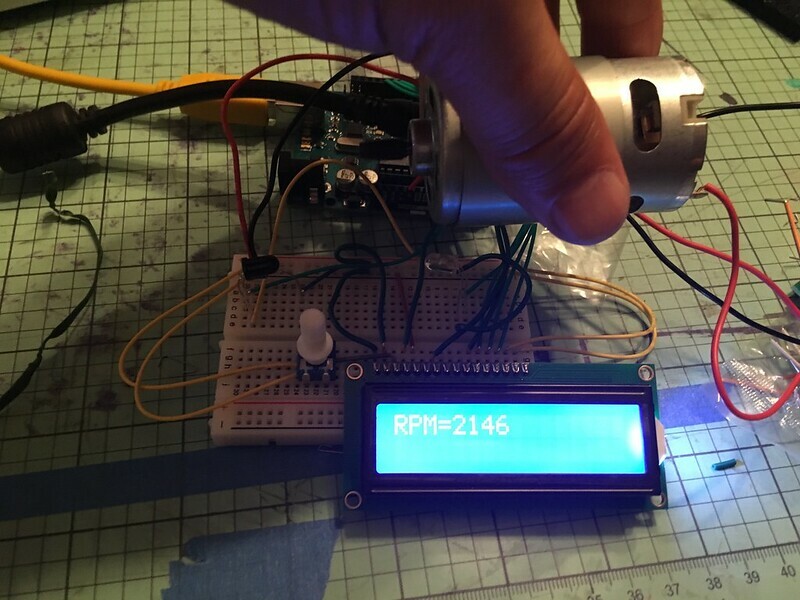 Next, I made an optical tachometer and counter with the Arduino board and IR LED and photoresistor. The picture is lousy, but you can see the two components if you look closely. The code and instructions I found on YouTube. 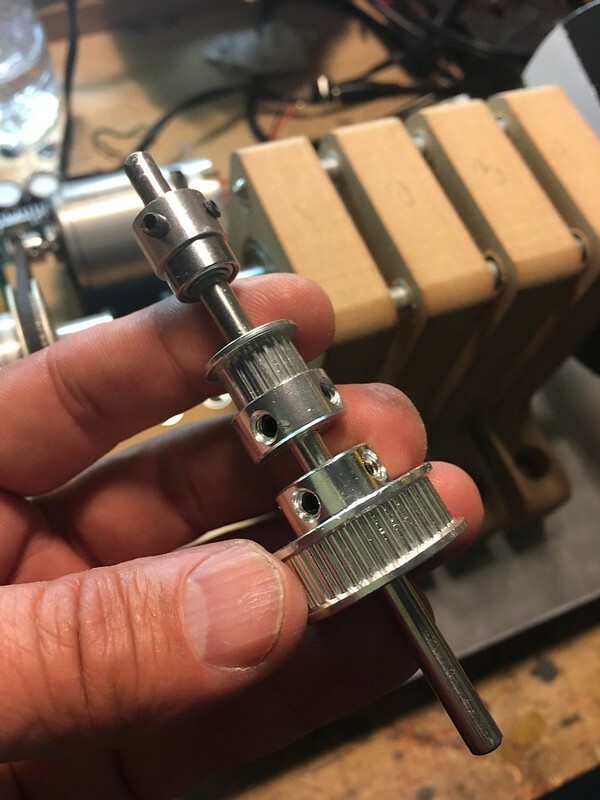 There’s a gazillion optical tach tutorials out there – I just picked one that used the same parts I have on hand. The interesting part about Arduino is that you have to get both the code and the electronics right. It’s kind of fun. I’ve done tons of coding and built quite a few stompboxes, so it was really no prob. The mess of wires below is the assembled tach. Lastly, here’s me holding the motor up to the tach. It’s another bad photo. I just put a flag made from electrical tape on the end of the shaft. I had to hold it between the LED and the photoresistor. 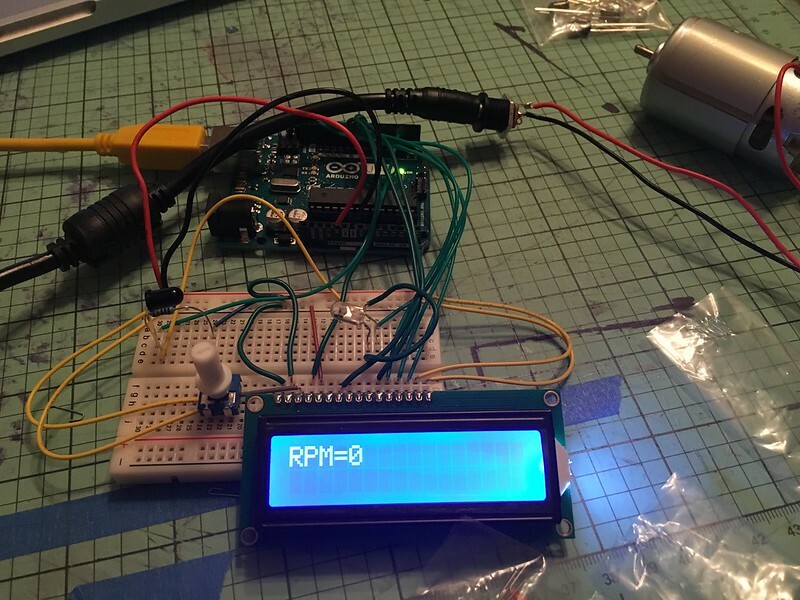 As the flag breaks the IR light, the photoresistor sees it and sends a pulse to the Arduino. I got it up to 5000rpm before the tape flew off. BTW, turning this into a wind counter is super easy. At one point I created another variable that didn’t reset every second and displayed the result on the LCD. It worked no prob. From here I’m going to build the stepper motor control. The script is a little more complicated and I’m going to have to do considerably more than just cut and paste like I did today. I also have another LCD screen that’s a little more sophisticated and uses fewer pins, so I’ll have to wire that up at some point as well. Once I do all that, I’ll mount the wires more permanently on a piece of stripboard. 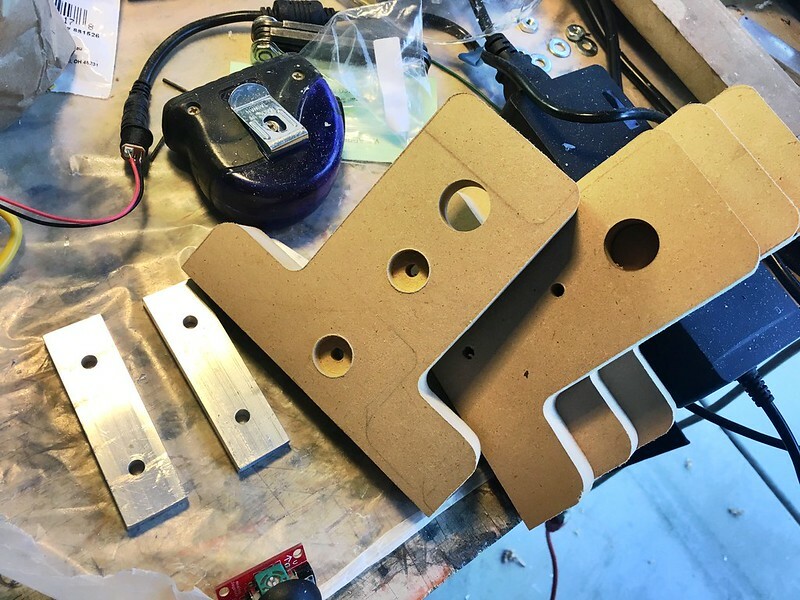 I think that this will be the hardest part only because I’ll have to design a functioning parts layout. 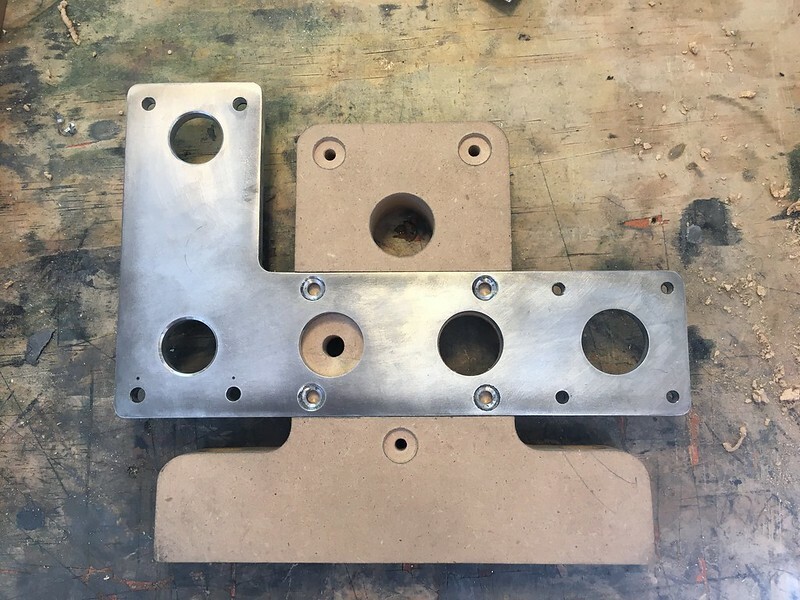 The carriage will just be a base that holds a couple of pulleys and the stepper. Lastly, I have some more parts on order. They should be coming within the next few days. BTW, the cost is going to run about $125-$150. I could have done this much more cheaply – for one, I ordered the Arduino Basic Kit, which was not really necessary. I was really expecting that there’d be a good manual included, but most of the info was based around the super basic projects that came in the box. That being said, I don’t regret the purchase only because it comes in a really beautifully designed package. Secondly, I could have scoured my local thrift stores for an old cordless drill and an inkjet printer for my motors, steppers and some of the pulleys. I just decided that for me, it would take more time to scavenge than it would just buying the parts on ebay and stuff. I just wanted to focus more on the design than searching for used parts.